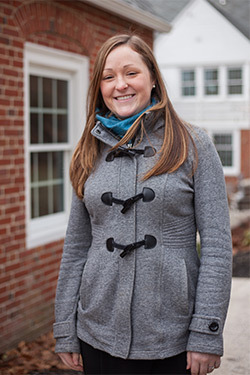 Born and raised in Titusville, Pennsylvania, Brittany discovered Juniata College early in her college search process. As a student-athlete, she was looking for the right mix of academics and athletics and found the personalized attention, small class sizes, competitive athletic programs, and the quiet, but powerful setting Juniata provided in both realms enticing and rewarding. While a student at Juniata, she was a member of the Omicron Delta Kappa Leadership Society and also played on the Women’s Volleyball team that won the 2006 NCAA Division III Women’s Volleyball National Championship. She graduated from Juniata in 2009 and earned her Master of Science in Physical Education: Sports Administration from Eastern Kentucky University in 2011. She spent the last 5 1/2 years working in admissions assisting students from the Midwest, Northeast, and Southeast, most recently serving as the Associate Director of Admissions at FDU-Florham, before returning in February 2017 to her alma mater. Working in higher education, Brittany is passionate about supporting prospective students in their search for the right fit. She believes the most important aspect of the college search process is the campus visit and encourages prospective students to search both near and far, believing that ultimately, finding a home away from home is critical to molding future successes and growth for any college student. Brittany is a staunch enthusiast of collegiate and professional athletics and met her husband Glenn, current Juniata Men’s Volleyball Coach, at Juniata. They have been married for 5 years. The DeHaven’s reside in Huntingdon and have one daughter, Aria.